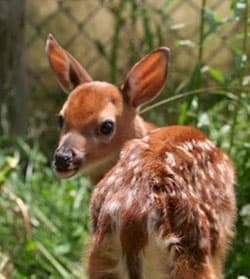 Regular Wildlife Program fees for Maine Wildlife Park are $5 per person for tours and/or wildlife education programs. Fees apply to students, teachers, chaperones and others accompanying the class, and includes general admission. There are picnic areas with plenty to see and do before and after your scheduled program or tour -- to make the most of your total trip experience. Maine Wildlife Park programs are held outdoors, under our open-sided pole barn shelter suitable for seating up to 80 children at picnic tables. These programs are held rain or shine, so dress for the weather! Maine Wildlife Park tours are led by trained volunteers, last 1-2 hours depending on group size; and generally meet at the water fountain in front of the Visitor Center. The Nature Store offers one free pass (a $5.50 value) for a future park visit to any child who is part of a wildlife program or tour AND who makes a purchase of $1 or more in the Nature Store! The Snack Shack is full of affordable (many less than $1) items; and both support the park and its wildlife. You may register for all wildlife park programs by calling 207-287-5244. If you need to cancel once you have registered, please call and let us know so that another class may participate. We are looking forward to seeing you and your students at the Maine Wildlife Park this year for exciting and informative wildlife and conservation education programming. All wildlife programs are on Tuesday and Thursday mornings, 10am and 11am, rain or shine, in the pole barn classroom shelter. Please dress for the weather! Maine Wildlife Park guided tours are a great way for your group to learn more about native Maine wildlife up close! Due to a very limited number of tour guides, guided tours are available Monday through Friday throughout the open season for groups of 15+ people. Reservations required - please call (207) 657-4977 ext. 0 to book. Please make every effort to be on time for all programs and tours! We understand that bus schedules vary, but please build in enough time for slower buses, morning traffic and finding your way to a new location. Better an early arrival, with enough time to use the restrooms, than a late one!!! Please count your money and your kids! Please know the total number of people in your group (teachers, parents, kids) and have the admission/tour fees counted out prior to your arrival. Counting bags of change at the Park admissions gate only delays your program, and others who are waiting to enter.